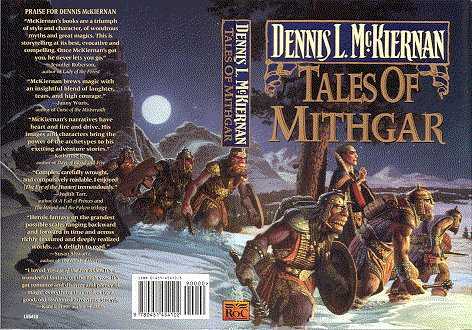 Foreword to "Tales of Mithgar"
O, could I but go to Mithgar and see all its many wonders — to see Elves and Dwarves and Warrows and knightly Men and beautiful Women, Utruni and Wizards, Mithgarian Wolves and Draega, and Fire-drakes and Cold-drakes and serpents of the sea, and Krakens, and other fabled creatures; aye, even to see Rûcks and Hlôks and Ogrus, Hèlsteeds and Ghûls, and other Foul Folk and beasts not yet named; to see the Wolfwood and the Skög, the Great Escarpment, Darda Galion, the Quadran, the Great Maelstrom, Dragon's Roost, the Spindlethorn Barrier, Bellon Falls, Kraggen-cor, the Grimwall, Claw Moor, the Iron Tower, Caer Pendwyr, the Greatwood, the Khalian Mire, Dragonslair, Darda Erynian, and more — one of the places that would irresistibly draw me unto it would be the One-Eyed Crow, a tiny inn on the southeast corner of Market Square in the hamlet of Woody Hollow, there in the Boskydells. It's not that the 'Crow has a magnificent edifice, one that would compete with the glorious wonders of Mithgar, oh no. Instead, this small tavern, with its common room and fine kitchen, with its guest quarters overhead, with its wooden beams and stone fireplace and glass paned windows and timbers and thatch and clapboards and chimneys, this small tavern is as unprepossessing as an inn can be. Quaint it is, and a step or two out front, out beyond the stoop, there at the edge of the street, hanging by hook and eye from a post arm, a painted signboard swings in the breeze and proclaims this to be the One-Eyed Crow. On each side of the placard, a black bird with cocked head and gimlet eye stares out at passersby, as if examining them for shiny objects that birds such as these are said to covet. The crow's other eye is not visible, and given the name it makes me wonder if there is an eyepatch on the side we cannot see. Nay, no towering edifice is this tiny tavern, this tiny inn. Instead, it is a place of atmosphere. Cozy in the winter, cool in the summer, and cheery all year 'round. And could I but go to Mithgar, then this is where I would spend some time, soaking up that special atmosphere, and listening to Warrow-told tales. A curious mixture are the stories that Warrows tell, for some are childlike, simple but compelling, and are suitable as bedtime fare for the wee ones in your household; while others seem too intense for the ears of younglings, for they grip you by the throat and rattle your soul. A curious mixture, aye, but this should not be surprising, for Warrows themselves are a wonderful combination of childlike innocence and grownup wisdom, of gullibility and skepticism, of folly and discernment, of ignorance and knowledge, of laughter and tears. And these qualities are reflected in their tales. Folk and fairy seem some of their tales as well as tales of humor, while others bring a tear to the eye, and yet others might cause you heart to pound and your mouth go dry. Some are gentle to the soul, some charm the heart, while some are violent beyond reason. Yet in these characteristics — of gentleness, of charm, of violence — are Warrow-told tales any different from the tales of the Brothers Grimm, or those of Aesop, or those of other cultures, other nations, down through the ages? Yet Warrow tales are different in subtle ways from those of our own past. Gentle and charming and violent they are, aye; but they also bear the unmistakable stamp of a different folk, of the Wee Folk, though it is not easily defined. But I would fill my soul with such tales, had I the chance. And that is why I would spend time in the One-Eyed Crow, watching and listening and drinking deeply from this subtle spring, tasting the pure and gentle waters.